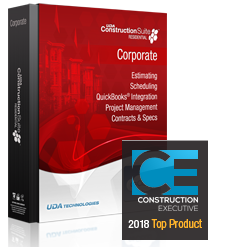 With hundreds of new features in Estimating, QuickBooks Integration, Scheduling, and Contracts, UDA ConstructionSuite Corporate also delivers the new Items Database, Integrated Calendar, Resource Allocation, Change Order Management, CAD Integration, Insurance Tracking, Workflows, Application for Payment, Lead Tracking, Cash Flow Reporting, tools for Property Development, and breakthrough ConstructionNet CRM technology. Take control of project management with the most comprehensive solution for construction professionals. ConstructionSuite is available for immediate download and shipment. Orders received by 4:00 pm (Eastern Time) M-F will be shipped the same day. Purchase includes CD, Electronic User Guide, and optional Download. Special Offer - New Monthly TotalCare Plans. ConstructionOnline, Priority Support, Training, and Upgrades. Learn more. TotalCare Select Optional TotalCare Coverage ---------------------------- Basic Support (30 Days Phone & 1 Year Email Support) ............................. TotalCare Options (Priority Phone Support, Online Training, and Upgrades) Monthly TotalCare Plan - Single License - Add $69.99 per month Prepaid 12-Month TotalCare Plan - Single License - Add $599 per year ............................. Monthly TotalCare Plan - 2-3 Licenses - Add $129.99 per month Prepaid 12-Month TotalCare Plan - 2-3 Licenses - Add $1199 per year ............................. Monthly TotalCare Plan - 4 Licenses - Add $189.99 per month Prepaid 12-Month TotalCare Plan - 4 Licenses - Add $1599 per year ............................. NOTE: Monthly TotalCare Support and Membership Plans are billed monthly and can be discontinued at any time. Prepaid TotalCare service will bill monthly after the first year.